I believe we have already posted about this website for the Sites of the Week in the past, however I would like to feature it on a full post because it's still one of the sites that really caught my attention in terms of beautiful execution and seamless integration of audio, video and typography. Kudos to Benjamin Guedj and Digital Creative Boutique Watson DG. 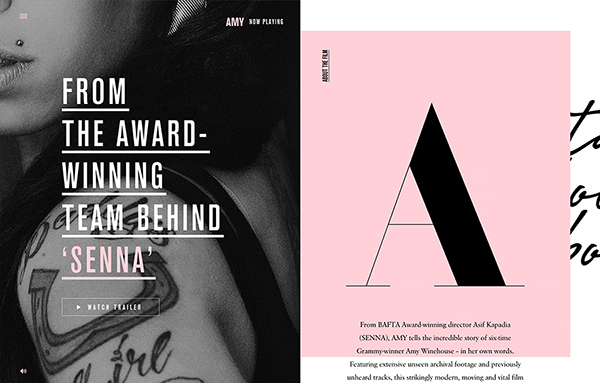 From celebrated documentarian Asif Kapadia, AMY is a powerful documentary exploring the triumphant career and tragic life of singer Amy Winehouse. 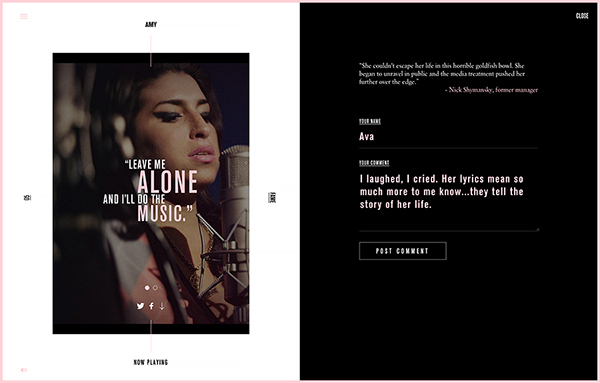 Watson brought the powerful documentary online by building a site that showcases a sampling of the unarchived, never-before-seen footage of Winehouse and gives users a forum to comment on their relationship with the film and the artist. 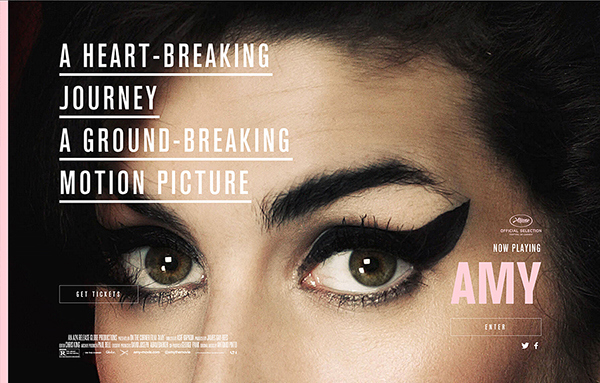 The AMY site is structured by themes that apply to both Amy Winehouse's life and the documentary's narrative arc. 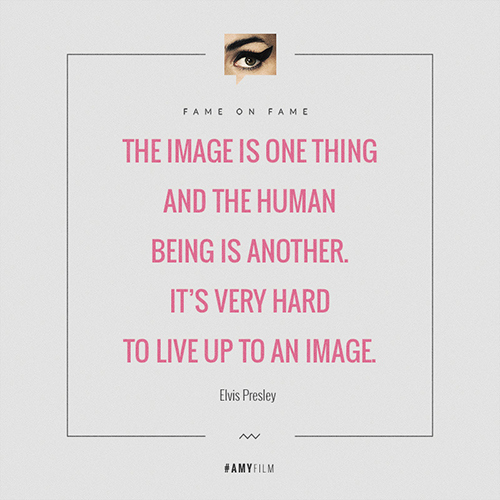 These themes serve to connect with the visitor on an emotional level and are brought to life by carefully cut and timed fullscreen background video. 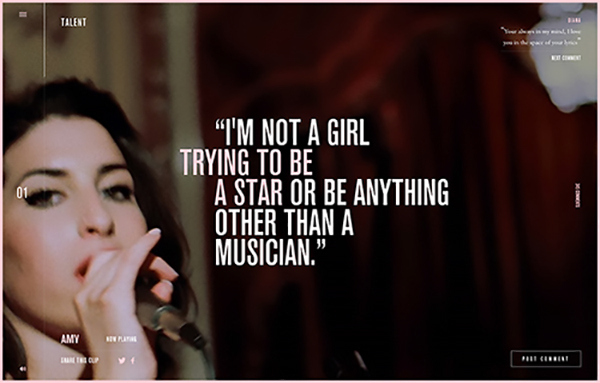 Because some of the most prolific commentary on Winehouse’s life comes from the artist herself, quotes by Winehouse from Kapadia’s film animate over each theme section’s video. 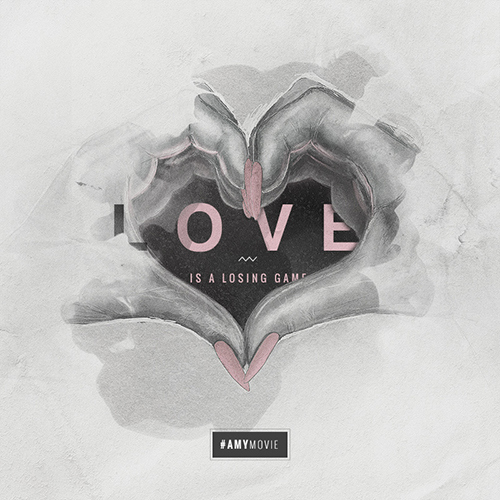 Throughout the site, fans of the film and the artist are able to leave their own comments to be displayed in each theme section. The site also serves as the documentary’s official online destination with link outs to ticketing and information on the director and production team. Visitors are also able to download a wealth of shareable assets throughout the site or link directly to a particular theme on social media.